If you want a single statistic that shows how the craft beer movement has become a world-wide phenomenon, let it be this: there are now seven eight craft breweries on the Mediterranean island of Majorca. They are part of the spectacular rise in new small breweries which means almost 300 craft breweries across the whole of Spain, 600 in France, 800 in Italy and so on. Life is a little different on Majorca from, say, Italy, where Italian craft brewers are making much-admired pilsner-style brews: no Mallorcan brewer makes a lager, simply because they could not compete with the Spanish giants, Estrella Damm and Mahou San Miguel, on price, but all seem to make a wheat beer (“blat” in Catalan), which is evidently seen as the entry-level craft beer for locals, and there are pale ales, IPAs, and speciality beers. 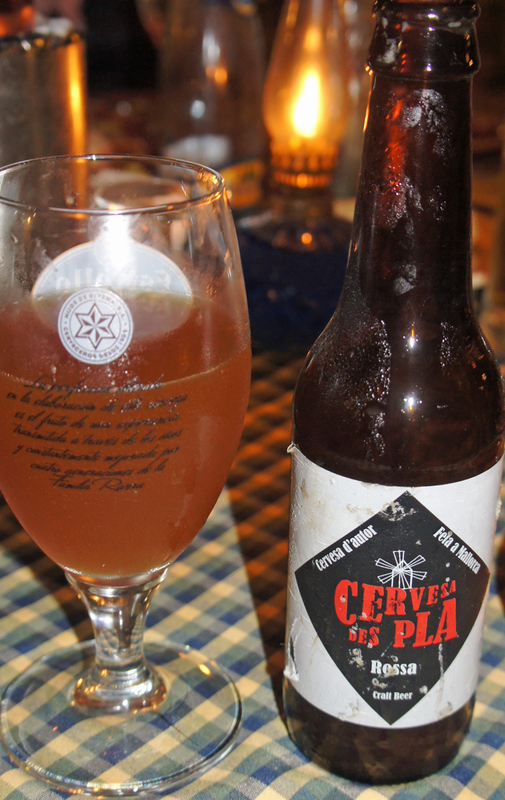 Most breweries seem to be bottle-only, although Beer Lovers in Alcuida, in the north of the island, kegs some of its pale ale. The quality is very occasionally dodgy, as you would expect from operations with hand-bottling lines, but then, of the last five pints of cask ale I was offered in London, one was cloudy as a wet weekend in Wicklow and another tasted like it had been brewed by Sarsons, so quality is not just a Mallorcan problem. 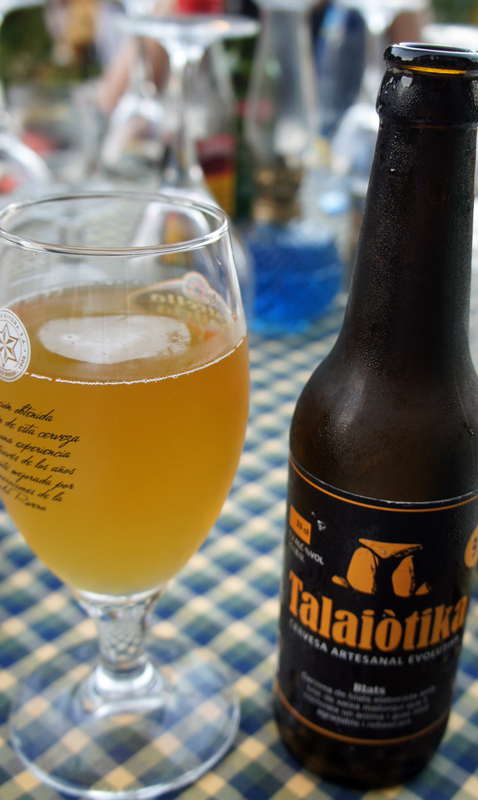 I managed to find beers from six of the island’s brewers, and generally the Mallorcan craft beers were a vastly better choice than their eurolager opponents. Several were excellent: I particularly liked the brews from the Sullorica brewery, in Sóller, in the west of the island, which makes a very good wheat beer flavoured with local lemon peel, and an equally fine amber ale, Original, which includes rosemary, lemon verbena and orange blossoms, though I was disappointed not to find the beer brewed with bitter olives the brewery was apparently making last year. 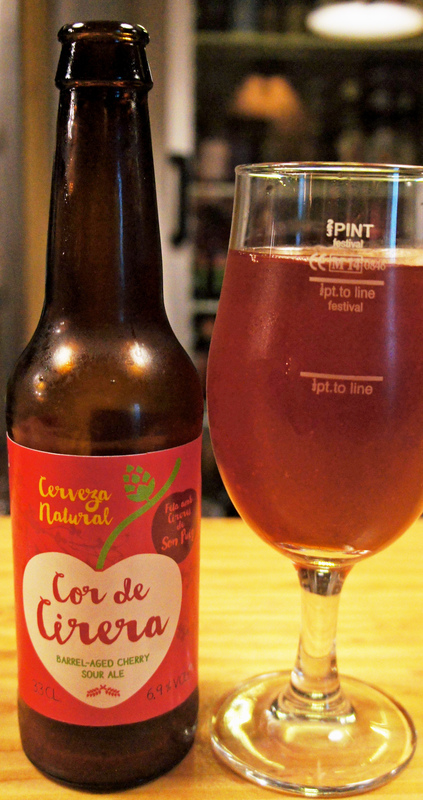 I also had a first-class sour cherry beer, Cor de Cirera, from the Cas Cerveser brewery in Galilea, about eight miles to the west of Palma, which is aged for a year in French oak barrels that had previously contained red wine from the Bodegas Son Puig in nearby Puigpunyent. Of course, the vast majority of beer consumed in Majorca is still big-brand eurolager, or, if you’re in somewhere like the fake Irish bars of Cala D’Or, keg Guinness. You can find Mallorcan craft beers in some of the island’s large supermarkets, in specialist shops, in restaurants that like to offer Mallorcan food and in Majorca’s craft beer bars, though I’d advise you to check out the brewers’ websites for advice on where their beers are available bewfore you go hunting. I was lucky and met a Barcelonan beer blogger called Joan Vilar-i-Martí, of the Catalan beer blog Birraire.com, earlier this year in Poland, who sent me details of Mallorcan brewers and bars. I only managed to visit one of the bars he recommended, Lórien in Palma: I normally keep at least the length of three or four bargepoles between me and bars with names taken from Tolkein, but this small, dark, hidden-away place, now 25 years old, is definitely worth a visit if you’re in the city: the beers on draught when I was there included examples from Italy, mainland Spain (from Pamplona, an excellent sour wheat beer, though definitely not the “hefeweizen” it claimed to be) and Ireland. 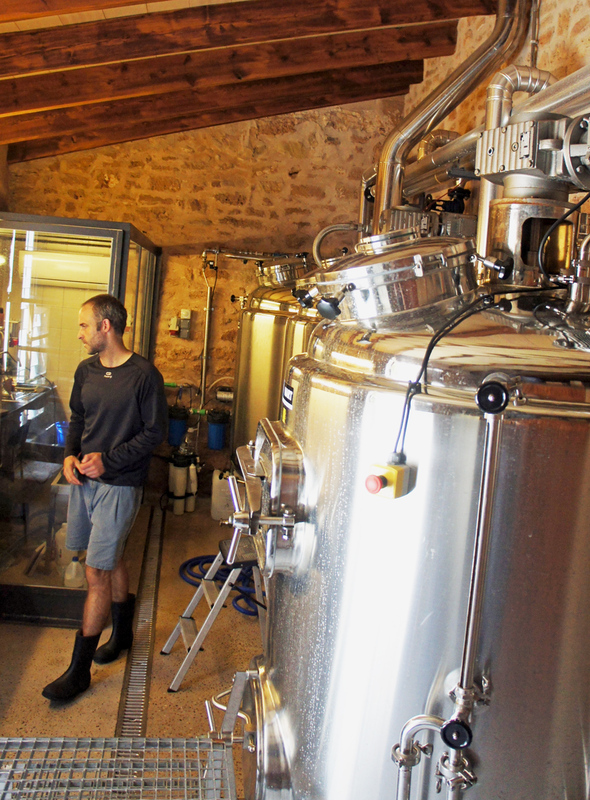 The brewing equipment – combined mash tun and kettle, and alongside that a combined lauter tun-whirlpool, plus in the front room of the barn three small conical fermentation vessels – comes from a firm in Catalonia that previously made kit for wineries . 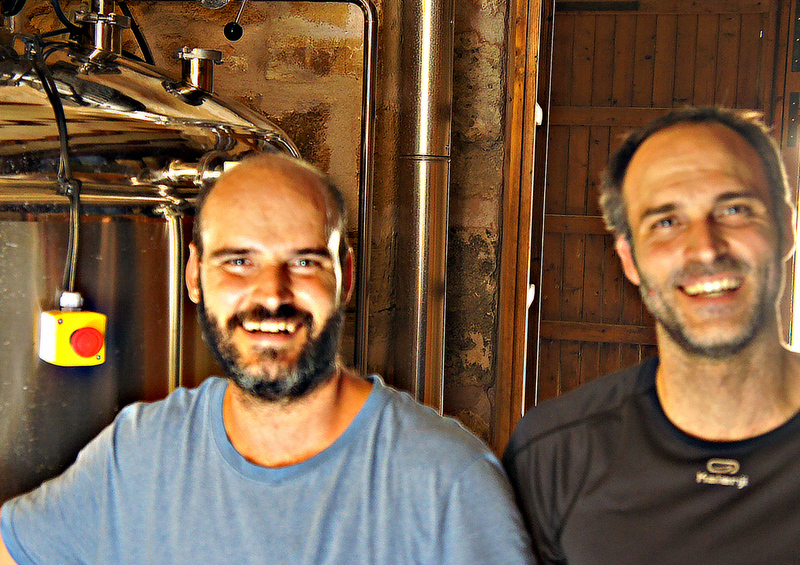 The boom in small breweries in Spain, now up to nearly 300, has been a blessing to such manufacturers, after the bodegas stopped expanding in the recession. Brewing capacity is 750 litres at a time, with brewing currently taking place once a week during the summer months, less during the island’s quiet season. There is actually a well inside the barn itself, but it smells musty, and Miquel says Mallorcan well water is not normally suitable for brewing: Beer Lovers actually tanks 3,000 litres at a time from a well in a place called Can Sales, around seven miles to the west, at the end of the Sierra Tramontana, which runs up the island, where the water has apparently spent less time travelling through Majorca’s limestone rocks, and needs no treatment to make darker beers with and only a little tweaking for pale ones. 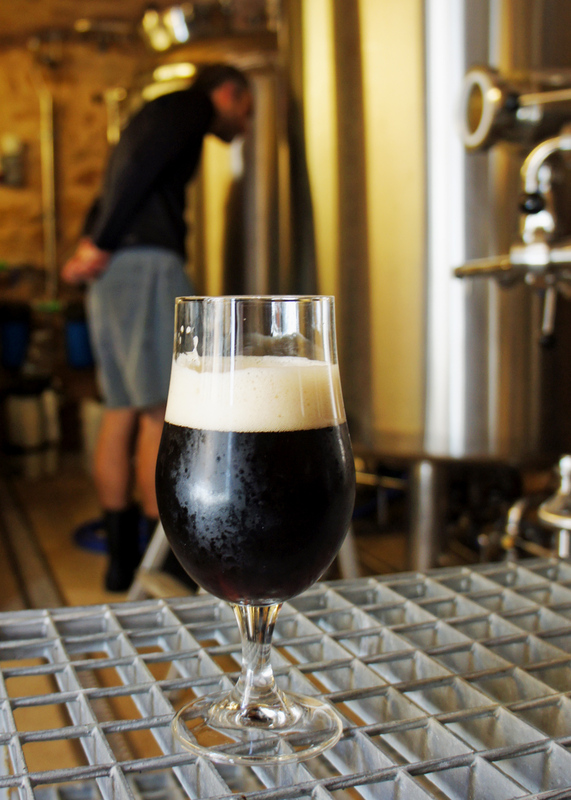 The brewery produces both bottled and keg beers, and their beer is on tap in a few bars in Palma. It makes five different beers, the original three, Blat, a Belgian-style wheat beer, and the brewery’s best-seller (“It wouldn’t be a beer I would have done as a home brewer, but this is a business, you’ve got to brew the beer people will buy, not the one you like”, Miquel says); Broll, a pale ale (“sales are growing, and if in one or two years we sell more of the pale ale I it will be mission accomplished!”), and Bram, an amber ale, “difficult to sell in Majorca, people see dark beers, they’re a bit taken aback”, plus, now, a porter, made just twice a year with English malt from Crisp (the one beer I tried at the brewery – a fine, deep ruby-brown drink with chocolate and coffee in the depths that enabled me to justify the joke in the headline*) and Llop, Catalan for “wolf”, an IPA that Miquel confesses began as an accident after they over-hopped a batch of the amber ale. Miquel and his team decided to dry-hop the beer as well before releasing it, and it found enough of an audience for them to have brewed six more batches since. “For me it’s the best one we’ve got”, he says. Most of the malt, except for the porter, comes from Weyermann in Germany via the Spanish mainland: “there’s plenty of barley in Spain, but the maltsters are owned by the big companies, so you can’t buy it even if you want,” Miquel says. All the bottles, incidentally, carry a full list of the malt and hop varietiers found in the beer inside – other brewery please copy. The brewery is open to the public on Fridays and Saturdays, when Miquel and his team showcase the suitability of their beers to be matched with food. It certainly matches extremely well: right after my visit to the brewery I had a lunch of gambas (prawns) in a garlicky, buttery sauce with a bottle of Broll in a restaurant 100 or so yards away that was marvellous. As news about Beer Lovers spreads, Miquel is also finding holidaying brewers from Denmark, Germany and other countries – and beer writers like me – arrive on the brewery doorstep. The brewery’s major problem, like other small concerns, is distribution: Miquel is still struggling to find one who an do a good job for craft beer in a culture that, despite a growing number of craft beer bars, is still heavily biased towards drinking the same very few big names. 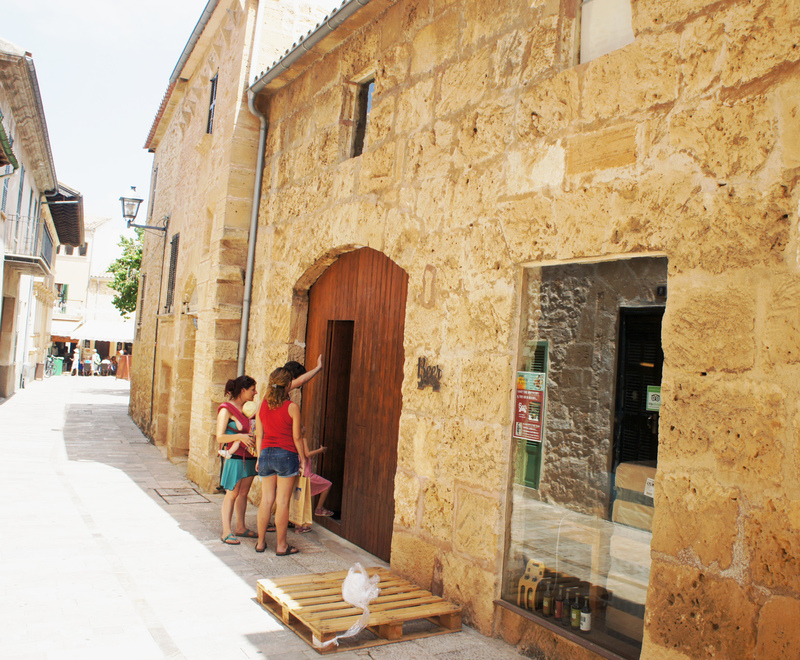 Still, when Beer Lovers started there were two small breweries in Majorca – now there are seven or eight. 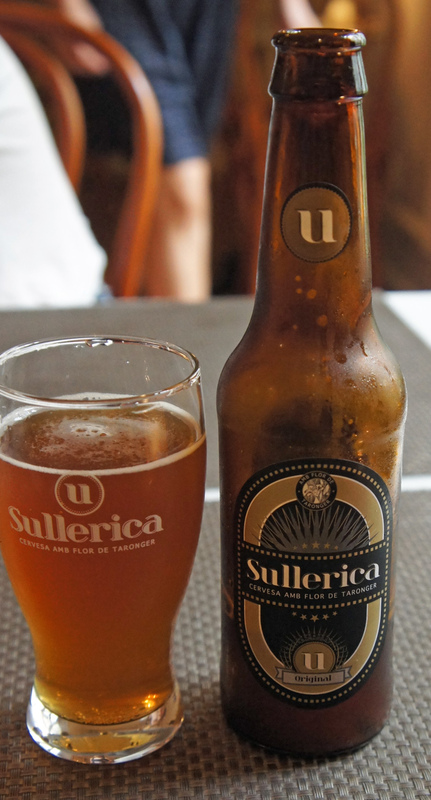 My personal suggestion to the brewers of Majorca, for what little it may be worth, is to do what Sollerica appears to be trying to do, and Cas Cerveser, and make distinctively Mallorcan beers using Mallorcan ingredients: beers that could not come from anywhere but Mallorca. Moli Balear wheat beer, flavoured with coriander and bitter orange peel and brewed in Campanet, about six miles south-east of Alcúida:although this gives the impression of being brewed in Majorca, I’m told by a reliable source that it’s actually from the Huyghey brewery in Belgium. 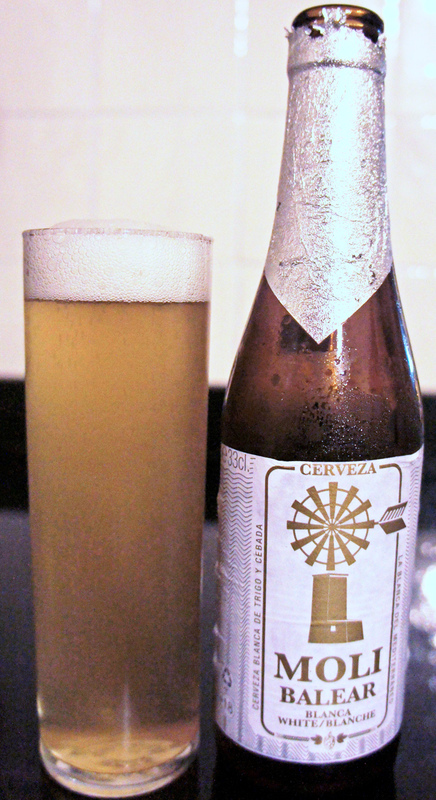 The label shows a typical Mallorcan windmill. Italy has a lot of ale. In my last three visits (Milan, Rome and Cosenza) each had good craft bars and microbreweries. I didn’t find craft lager, though. Cosenza had the best porter I’ve had! Italian barley wine should get its own BJCP category! Hell – you wrote about craft beer in Mallorca and forget Tramuntana and Forastera….such a shame…..but you have Moli Balear instead. Well, that would be because I never found those two breweries, while Moli Balear succesfully presents itself as Mallorcan, and certainly fooled me.